Daniel Walsh from Knock, Claremorris, has been acknowledged for his contribution to dairy farming excellence at the Aurivo Milk Quality Awards. Pictured, left to right: Pat Duffy (chairman), Kevin McStay (guest speaker), Aaron Forde (CEO), Daniel Walsh, Anne Walsh, and Jarlath Walsh. Now in their 11th year, the awards recognise the standard of excellence in dairy farming by Aurivo milk suppliers, as well as their dedication and commitment to milk production in the previous year. Prizes were awarded at a special ceremony at the Radisson Hotel Sligo on May 9. Mr Walsh received the award for Highest Average Milk Solids. He started farming with his father Jarlath in 2003, when they had a high yielding Holstein herd. In 2007, they began using Jersey straws on the cows. This continued and today, Jersey straws are used on the higher yielding cows, while Friesian straws on the lower yielding cows. Some Norwegian straws have been tried to improve health traits of the cows. In 2009, they formed one of the first milk partnerships in the country. In 2017, they milked 120 cows on their 42-hectare milking platform, with more land rented for heifer rearing. Twenty in-calf heifers are now sold annually. Current yields are 5,600 litres of milk at 460kg milk solids. Cows on average achieve five lactations. This is not a dry farm, with a lot of drainage done on the wetter fields. In 2017, silage had to be fed in eight months of the year to avoid damage to fields. Silage is made in the form of high quality, dry round bales which reduces the negative impact when feeding silage on milk solids. 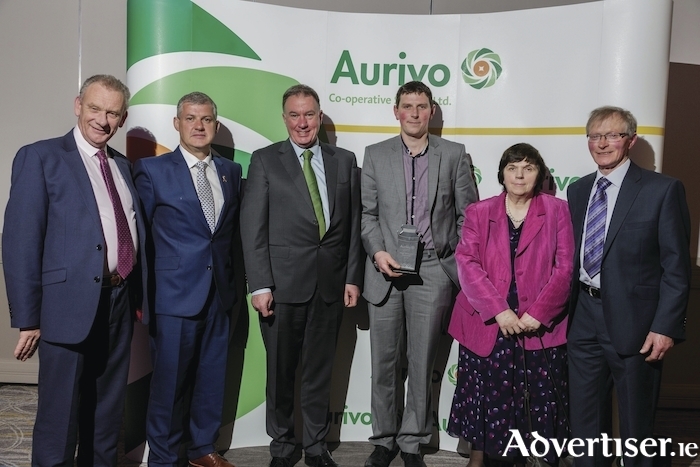 Speaking at the event, Aaron Forde, chief executive of Aurivo, said: “Aurivo is very proud of its quality milk pool and that’s down to the unfaltering commitment of over 1,000 suppliers across Ireland. The Milk Quality Awards celebrate the excellent standard of milk they produce every day.